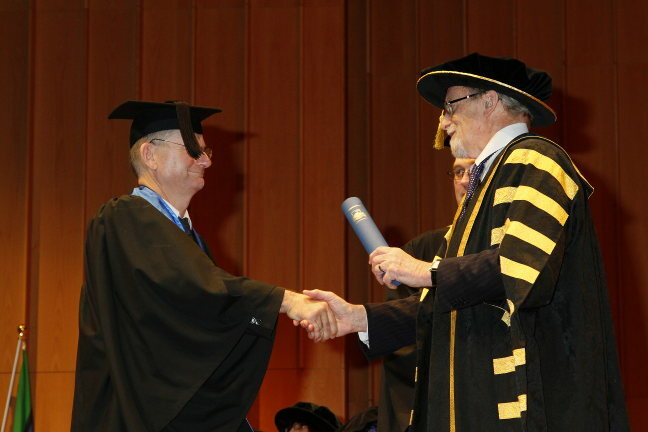 Greetings from the conferring ceremony at Lewellyn Hall, the Australian National University in Canberra, where I am to receive a Graduate Certificate in Higher Education, from the Chancellor, the Hon Professor Gareth Evans AC QC. It was July 2011 when I started looking at postgraduate education qualifications and August when I selected the ANU, for Learning On-line Tertiary Teaching for Research-Led Education. The courses I selected in consultation with my education adviser, were: Assessment, Evaluation and Learning EDU5713 and Online Pedagogy in Practice EDU8114, online at USQ, followed by "Research Supervision" and a capstone course at ANU. The intention was to develop a form of e-learning which suits a research oriented university, like ANU. I believe I have achieved that (you can read my postings about "University Teaching" along the way, but in the process re-learned an appreciation for how much hard work it is to be a student. The graduation ceremony is a little bit Hogwarts, with the participants dressed in an assortment of academic gowns and hats (mine is giving me a headache). We all had to have our colored sashes carefully positioned. ps: In a 1993 fictional future history "Canberra 2020: World Information Capital" I made Mr. Evans the UN Secretary General, which caused him some amusement.